The sun is dawning over the Indian Ocean revealing the magnificent coastline and the white, palm-lined beach of the Blue Water beach Lodge. 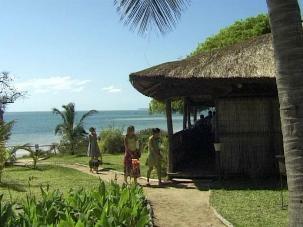 For those visiting Vilanculos who need quiet and tranquility, Blue Water Beach Lodge is the place to visit. 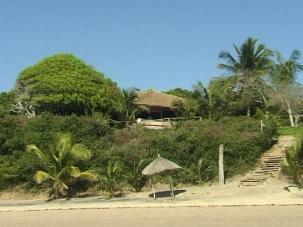 Situated out of town with its own private beach, away from the hustle and bustle. The bar and restaurant are set high on the dune overlooking the breathtaking turquoise blue water of the Indian Ocean. Here you can enjoy the beauty and magnificence of the area in the company of your friendly host and fellow guests over an ice­ cold beer or cocktail. The beach is never crowded. Just relax and enjoy life by doing nothing or indulge in the various water sport activities on offer. Accommodation at the lodge consists of neat 2-and 4-bed fully equipped rondawels and A-frame huts overlooking the ocean. The lodge also has a beautiful shady campsite, with neat spacious ablution facilities, with hot and cold water and plug point.